Big moves begin this new year. We’ve got a Full Moon + Super Moon in Cancer on 1 or 2 Jan (depending on where you are on this planet – in Singapore it’s on 2 Jan at 10:24 am), and Uranus ends its retrograde in Aries on Tuesday, 2 Jan.
Let me just say something about January 2018 first. There’s going to be a lot of Lunar action going on this month, and I mean A LOT. The Moon influences emotions, and will play a big role in how we feel and act. The Moon also influences mental health, so this month’s lunar transits can get some people emotional to the point of becoming psychologically unstable at this time. Those of you who are already predisposed towards excessive emotions, and/or have a lot of Water signs in your birth chart, need to be mindful of your feels. Take care of yourselves, bbs. With the current Full Moon + Super Moon in emotionally sensitive Cancer, we’re receiving an extra boost of tender emotions and a longing for the comforts of home. Which is all well and fine so long as we don’t stumble into the shadow aspect of Cancer, which is paranoia, emotional manipulation and self-victimisation. Darlings, learn to discern between the heart and the ego, and always act from a place of love + truth. No one owes you happiness except yourself. Just a quick note about the numerological value of this year: a lot has been said about 2018 being a Number 11 Year (2 + 0 + 1 + 8 = 11). The energies of Number 11 are associated with heightened psychic + healing abilities, as well as visionary gifts + talents. 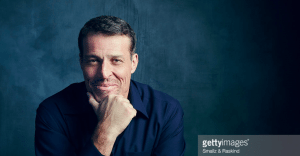 An example of a Number 11 who’s done well would be life coach, entrepreneur, and near-superhuman Anthony Robbins (both his Personality and Life Path Number are 11). This year, let’s tap on Number 11’s immense possibilities and avoid its shadow aspects, which are egotism, deception, and delusional thinking. Whatever it is you want to achieve in 2018, keep yourself grounded. See reality exactly for what it is, and respond accordingly. Free yourself from self-limiting fears + insecurities. Don’t stop at dreaming: combine high ideals with right action, and you’ll do well in 2018. Let’s get to our first Tarot & Oracle reading of the year! LEFT: STRENGTH REVERSED. This week, your fears might be getting the better of you. Perhaps the project or role you’ve been assigned is causing you some concern. With Strength reversed, hang in there. It’s possible that many of your insecurities are creating problems that don’t actually exist. Face those fears; understand that you can and will overcome them. Life isn’t meant to be lived in fear, but in love, joy and peace. MIDDLE: PAGE OF SWORDS REVERSED. This week, you could receive some form of communication at work that might not be to your liking. The Page of Swords in reverse refers to something that might be tactlessly said; it can also refer to a contract, a letter or an e-mail that needs to be read carefully. The Devil is in the details. Check the fine print. RIGHT: THE EMPEROR REVERSED. This week, issues of responsibility could be at the forefront. Be careful to get your power back if you’ve been giving it away; alternatively, if you’ve been the one doing the taking, you’ll need to take a more respectful approach to the situation. If you’ve been sitting on a matter that requires your attention, now is the time to take action. BE BLESSED: MILK AND HONEY. This week, gratitude is the key to receiving blessing from the Universe. Open your heart to perceive the abundance before and around you, even in difficult times and challenging situations. You’ll find it opens the door to even more blessing! BE CAREFUL: YANG. In the warning position, Yang reminds us to be gentle and compassionate even in the midst of our striving. All the planning and politicking in the world won’t give you an extra ounce of happiness. You may have your ideas about how things should be run, but it never hurts to be kind as well. Hold back on the aggro. BE ADVISED: TIME TO GO. 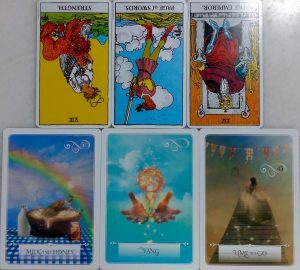 As advice, this card indicates the end of a cycle and the transitional period before the start of a new one. As we cross over into the new year, look forward to the new and unexplored terrain of opportunities that awaits you. Whatever lies ahead, you’re going to be alright.